Juicy, tender chicken quarters get the Mediterranean treatment with the help of Dorot pre-portioned fresh garlic and herbs! Plans are a strange thing, a bit of a paradox produced by our restricted view of time. Without plans, we are left directionless, subject to the mercy of the whims of chaos. Yet, the uncertain nature of being confined perpetually to the ‘present’ means that pathing one’s way into the future is an uncertain and, at times, futile process. As the old Hellenic proverb runs, and I paraphrase, “The future is unknowable, a quantity always beyond our grasp, a destination never to be reached.” Combined with a foggy, and increasingly dim view of the past, it’s a wonder we humans can chart our course at all. I found myself in such a predicament a few weeks ago when I had planned a late-summer day out in the fresh air. I had planned on enjoying a classic September in New York combination of comfortably chilled air, sunshine, and sea breeze. 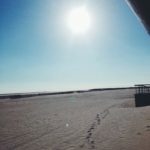 It had been quite some time since I had taken a full day off from worrying about the site or cooking, and I decided that the ‘present’ was as good a time as any. After much planning and preparation, I had cleared a full day’s schedule. There would be no site work to worry about, no assignments that needed writing, and no cooking to be done. However, as the future would have it, a bout of unpredicted rain, wind, and high tides canceled my day out, rendering my plans worthless. Thus, the best part of my planned day off was the planning itself. Thus it was that I found myself perched beside my bay window in possession of an entirely cleared schedule and nothing to do with it. Looking back, it was an idyllic scene actually, like something plucked straight from a Hawthorne novel. Picture a storm-grey horizon pulled across ghostly Atlantic waters cresting against a rain lashed pier, with the lonely echo of wind chimes and nautical bells drifting like silver on the storm churned air. A positively nostaligic scene, to be certain, but not one that lends itself all that cooperatively to a planned day out. That said, I had precisely two choices before me. I could forgo taking the day off, something it appears I am increasingly not mean to do, or I could find a way to spend my day off at the office…I mean my home. “When you work at home, you never really leave the office,” as the saying goes, a sentiment I could not possibly have related to more. Fortunately, what I do at my ‘office’ is also a form of enjoyment for me. That said I decided to prepare my table as if company were coming, and then enjoy the meal beside the stormy scenery of my bay window. To start, I had picked up some chick legs and thighs from the butcher a day or two earlier, and I decided to prepare those Mediterranean-style. Not only would they look great, but they would provide something wholesome and ‘homey’ beneath these grey skies. To do this, I started out with a new product I had picked up at Trader Joe’s – Dorot Crushed Garlic and Chopped Basil Cubes. I heated up my cast iron pan with olive oil, then set the chicken skin side down, and tossed in the garlic and basil cubes. The cubes then melted around and over chicken, releasing their locked in fresh flavors. Essentially, Dorot products take the fuss out of herb preparation and selection, something especially useful on days like today, or when you’re crunched time. They are a great, innovative product for precisely the sort of convenience we all crave in the kitchen. Honestly, it’s a bit like having a sous chef on scene. From there, I added in lemon juice, capers and artichoke hearts to complete the Mediterranean flavor profile I was going for. Then it was a matter completing the table, which I rounded out with sliced Grilled Eggplant, Grilled String Beans, and artisan bread, as shown below. Once those were finished, it was time to eat alongside the rain and wind. 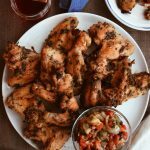 Combine the salt, pepper and dried oregano and rub each chicken leg with the rub. Heat a large cast iron frying pan with the olive oil. Place the chicken leg skin side down in the pan. Drop the garlic and basil cubes on the chicken and spread over each leg. Cook the legs for 20 – 25 minutes before turning. Add the crush tomatoes, lemon juice, capers and caper juice, artichoke hearts and artichoke juice; then loosely cover the pan. Cook for another 1 ½ to 2 hours or longer on a gentle heat. The chicken will be fall from the bone tender. Place the sliced eggplant in a large bowl. Add the salt, pepper, lemon juice, olive oil and Dorot garlic and basil cubes. Toss and let sit for 30 minutes. Heat a griddle with a drizzle of olive oil. Place the eggplant slices on a griddle and when a nice char is achieved on one side gently turn over and finish grilling on the other side. Plate and serve with fresh grated cheese. That was my rainy day off. What are some of the ways you spend rainy days? Especially the unexpected ones. We would love to hear from you. Don’t forget to download your special offer coupon for Dorot!! I would love to try the chopped basil! I would like to try their Crushed Garlic and Chopped Basil! The crushed garlic would be great for us. We tend to cook with quite a bit of garlic in almost everything we eat. Garlic, Ginger, Basil, & Dill. I would love to try the Crushed Ginger. I love ginger and I know this would be awesome! I'd be most interested in trying the crushed garlic. I would like to try the Chopped Chili. I'd like to try crushed ginger. I want to try the Chopped Basil. I use this herb a lot. I think it would be handy to have some chopped cilantro in my freezer. I often make Mexican food, but cilantro can go to mush, so quickly! I want to try the crushed garlic and sure hope my local trader Joe's carries this! This product is great! Too often I find that I need something for recipe and either don't have it on hand, or what's left from a previous meal just isn't in a condition I want to use. I've been wanting to start a small indoor herb garden, but my first attempt failed. I'm the type who can kill a plastic plant. LOL! I could see using most of the varieties, but especially ginger, garlic, basil, and cilantro. When I use onions I use tons, so I likely wouldn't use the onion variety (I'd need too many packs), but for so many of the other things, they would be a godsend. I really don't like using dried herbs, but keeping fresh on hand isn't the most practical thing, most of the time. I'll definitely be checking these out. I would like to try the crushed garlic,I love garlic so much,it's got to be one of my favorites by far! Oh wow, I would love to try the crushed garlic, basil, dill and cilantro. I would be most interested in trying the cilantro, basil and garlic. I'd love to try the Chopped Basil! I would love to try the Sautéed Glazed Onions. So much better than crying while peeling an onion! I would love to try the crushed ginger~! I would love to try the Chopped Cilantro. The chopped chili is the one I want to try. I would love to try the crushed garlic. I use garlic all the time when cooking! I would love to try their basil and garlic! I hate chopping garlic! So convenient!! I've never heard of these before today. I would love to try all of them, but probably the garlic the most. I use a lot of garlic. This is really fantastic. I must look for them. I would love to try the Chopped Parsley. 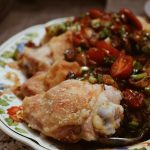 I was thinking of getting a good chicken and making it with carrots and celery - I love parsley with it, this would be perfect! I'd love to try all of them but I am especially leaning toward the cilantro and the glazed onions. I haven't heard of this product before and look forward to trying it. My husband and I each enjoy cooking and we use garlic in almost everything! It would be wonderful to try Dorot’s Garlic. The sautéed glazed onions would be aero some to try. I can't get enough sautéed onions!! I can't wait to try the basil. I waste so much money on basil that goes bad. I like te chopped cilantro - I always need some for recipes but don't want to buy a whole big bunch all the time. I would love to try the chopped cilantro! What a flavorful dinner recipe! This looks fabulous! I'm fascinated by the concept of the Dorot cubes - would really like to try the basil. Love your recipes too. The chicken is especially tempting. I would like to try Crushed Ginger. I want to try the Chopped Cilantro and the Crushed Garlic. Sauteed Glazed Onions has lots of possibilities! I would like to try the Sauted Glazed Onion. Chopped cilantro. I have tried so many ways to freeze cilantro, unsuccessfully, so I am very glad to see this. I so love spicy foods, I wanna try the Chopped Chili Tray! Crushed garlic for me. Seems this would save a lot of time. Rain is always sure to mess up plans! I would love the Chopped Cilantro for chicken biryani! I want to try the Sautéed Glazed Onions. I would love the Dorot’s Sautéed Glazed Onions! I'd like to try the Crushed Ginger. I am a huge ginger fan so i would love to try the crushed ginger, but the basil looks amazing too!! Thank You! Sauted glazed onion sounds heavenly right now! I would prefer the crushed garlic. Love to try the crusshed ginger. I would love to try their Chopped Basil. I'd love to try the crushed garlic because we use so much of that here at our house. And the sauteéd glazed onions, too! I am totally a planner, too, Catherine! I have my whole week planned out, and I try my best to stay on schedule...it doesn't always happen though. And lists! I love my lists. And I love deleting things off my lists! Your rainy day does indeed sound idyllic, even if it wasn't great for spending the day outside. 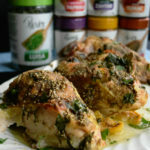 Looks like you used your time wisely though as this Mediterranean chicken sounds incredible! I'm all about some pre-chopped garlic. That stuff is way too hard to chop. Thanks for the suggestion here! Wow that looks delicious! Thanks! The crushed ginger tray sounds perfect! I love that flavor in my stir frys. I would love to try the garlic! I hate how my hands smell after mincing up garlic myself, so this is a great idea! The frozen crushed garlic would be very handy! The garlic and cilantro would definately come in handy.. I'd like to try the chopped cilantro. Fun concept and product! I would like to try the crushed garlic tray. I would like to try their garlic and their cilantro. I would like to try the crushed ginger. We cook a lot an I want to try them all..especially the Chopped Basil! The chili or garlic tray! Would love to try the sautéed glazed onions!! !and the crushed garlic I LOVE garlic! i would love the crushed garlic. we use it so much and its a pain to do! Since I love the smell and taste of Cilantro. I would have to choose the Chopped Cilantro Tray! I would love to try the Crushed Garlic and Chopped Basil! I love cooking Italian food! I'd like to try the chopped cilantro. I would like to try the Crushed Garlic. We would use a lot of the garlic & cilantro in our kitchen! And dill! I would love to try the basil. I use a lot of basil in my cooking and this looks very convenient. My specialty is CHILI so I love the chopped chili tray! I grow a lot of my own herbs. But I would like to try the garlic and ginger trays. I want to try Dorot's dill, cilantro and chili. sauteed-glazed oinons, we like them. I would like to try the Chopped Cilantro. I would love to try the cilantro. we are always using it in our mexican dishes. I think we would like the crushed garlic, crushed ginger, chopped basil, chopped chili and chopped dill. I would love to try the Chopped Dill. I'd love to try crushed garlic! I'd like to try the chopped basil! I would love to try their chopped parsley. I would like to try garlic, cilantro and chili! I would like to try the Crushed Garlic and Chopped Parsley. Since my family enjoys garlic so much I would love to try the crushed garlic. I'm so glad I learned that these are available. I would like to try Sautéed Glazed Onions. I would like to try the chopped basil. I would try the crushed Garlic!! I'd love to try the crushed garlic and the ginger. Thanks so much for the chance. Crushed Ginger Tray is what I would like to try. I would do the ginger, garlic and chili.What a great idea! Sautéed Glazed Onions... I'm thinking instant luscious sour cream based dip. The Sauteed Glazed Onions looks great to me. Definitely the crushed ginger. I can't eat the garlic or basil; I'm allergic. I would like to try the sautéed glazed onions . I would like to try the Dorot’s Sautéed Glazed Onions. Makes cooking so much easier. Chopped basil! Would love to try it! I would love the crushed garlic or the ginger. These would be awesome spices to have. I would like to try their Crushed Garlic and Chopped Basil to put into my spaghetti sauce. The herb id most like to try would have to be the crushed garlic. I seem to add it in moat everything I cook. I would like to try the crushed garlic. Hubby is Italian and puts tons of garlic into everything he cooks. I'd like to try the crushed garlic. I would love to try their Crushed Garlic and Chopped Basil! OH I have to say I would first try the Crushed Garlic! We use so much garlic, and I really dislike peeling them. Oh this would be so neat! I would like to try Dorot's cilantro and garlic. I would like to try the Crushed Garlic! I would like to try their Crushed Garlic. I would love to try them all but especially the Sautéed Glazed Onions because sometimes I just don't want to glaze the onions myself due to time constraints! Thank you! I would try the Sautéed Glazed Onions. The dill and the basil would be very useful. I use them often. What a cool idea to have portioned herbs. I'd really like to try the Garlic & Herbs. Now this product is for me, I work nights and find it difficult to prepare meals for hubby an I, I do like adding fresh herbs but unfortunately they go bad before I use them up. Hopefully our main store carries Dorot products. I would love so many of them...but first on my list the crushed ginger. I would like to try the Crushed Garlic. It's definitely the option I would use the most. I would love to try th sautéed glazed onions and the garlic. I would use those both a lot. I would love to try the chopped garlic. I use garlic in just about everything! I would like to try Dorot's Chopped Basil and Chopped Parsley. I use garlic a lot. I would love to try it out. So many yummy things i want to try them all. I think i woykd have to try the Chopped chili tray first as i love spicy stuff. I'd like to try the cilantro in some of my tacos and soup. The weather really can play havoc with the best of laid plans! 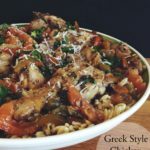 Nevertheless, your Mediterranean Style Chicken looks amazing - love the wonderful flavours you have used, as well as the Dorot herbs! How lovely to have fresh herbs on hand like that. This cacciatore looks like the perfect way to spend a day -- whether you're working or not! LOL! Rain has a way of dampening day out plans... pun intended. I usually end up at an antique store when that happens to me. I love this recipe... I make something similar but plan to try this combination of flavors! I've only seen Dorot a couple times in blog posts recently, so they must have not reached mid ohio yet. I'd like to try the whole meal!!! That is a very beautiful looking dish. Thanks. I 100% hate having to chop up onions, garlic and herbs so this sounds right up my alley. Fingers crossed I can find it in Canada! I would like to try the ginger. I've heard of ginger tea but never had the opportunity to try some. I would also like to try my hand at making ginger snaps from scratch. I have a recipe but never worked up the courage to try it. Besides the garlic, I think I would use the cilantro because I make things like chicken tortilla soup often. I have never heard of this product and I can't wait to try it! FYI - The Visit Our Sponsor Link for an entry is NOT working. I would love to try the chopped chili. I would use the basil the most, I think. would like to try the Chopped Basil,Crushed Garlic and Sautéed Glazed Onions, They sound amazing. I'd like to try the Dorot’s Garlic in their signature line of pre-portioned fresh garlic and herbs. They have a shelf life of two years and they would be so convenient to use in so many meals prepared. I had never heard of this product until today, thanks for the introduction. And your meal you shared looks so flavorful. Saved the recipe, thank you have been looking for new recipes to try. I use a lot of basil. I'd love to try their cubes. I love the taste of ginger so the first one I'd like to try is the Crushed Ginger. I would love to try the crushed garlic! I would like to try crush garlic never tried it before it would be nice to try something new. I like the garlic and the dill. I would love to try the Ginger, I hate grating it fresh. I would like to try the Dorot Frozen Crushed Ginger!!! That Mediterranean Chicken dish looks so good, and I could see the basil and crushed garlic coming in handy quite a bit, and I also love onion but my eyes are really sensitive and they will tear and burn to a point I have difficulty seeing clearly every time I cut one up so the sauteed glazed onions would be perfect for when for when I want to by=pass that. The sauteed glazed onions or maybe the chopped dill sound good. I'd like to try those! I want to try the Crushed Garlic. I'd like to try the Sautéed Glazed Onions. I would love to try the crushed garlic. I want to try the Parsley tray. I would like to try the Sauteed glazed onions. It would be nice to try them with some baby calf liver. Sautéed Glazed Onions pops out to me. I tend to use lots of glazed onions. Tacos, hamburgers, meatloaf, spaghetti. These would be helpful. I would love to try the crushed parsley and the chopped basil. They all seem rather enticing. I am torn between the sauteed glazed onions and the chopped chili.I love how you've created zesty easy additives to use while cooking at the ease of your finger tips.No more hassles of slicing and dicing,this makes cooking recipes not only at there finest but easiest as well using such rich ingredients. I'd love to try the crushed garlic! How convenient! I would love to try the Chopped Chili Tray! I would love to try the chopped basil tray! Love cooking with that. I would love the Dorot’s Chopped Basil and Chopped Parsley. I would like the Crushed Ginger. I would love to try the crushed garlic! I love cooking with garlic. I would like the ginger and dill. I would like to try their Chopped Basil, Ginger and Cilantro.